The Palace of the Grand Master of Rhodes. According to the Hellenic Statistic Authority (ELSTAT), which compiled a survey about museum attendance for January 2013, the number of visitors in Greek museums has increased by 15,2% in comparison to January 2012 bringing in 122,790 visitors, while 34,5% more people have visited Greek archaeological sites attracting 113,326 people. And this despite the fact that the total number of visitors of free entrance has also increased by 28,7% reaching 110,599. Furthermore, admission revenue has increased by 19,7%, thus 798,8 million euros compared to 667,3 million euros in January 2012. The most visited museum in Greece was the Acropolis Museum, bringing in 34,7% of the overall museum visitorsin Greece. 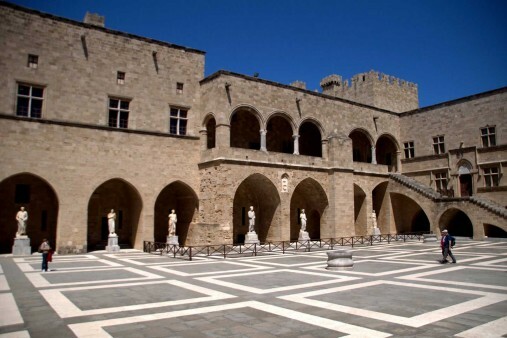 The National Archaeological Museum attracted 15,4% of the visitors, the Delphi Archaeological Museum 4%, the museum of Ancient Olympia 1,2%, the Heraklion Archaeological Museum of Crete 0,9%, the museum of the Palace of the Grand Masters of the Knights of Rhodes 0,6% and the Archaeological Museum of Rhodes 0,2%. It should be noted that according to the List of most visited art museums in the world, an attendance survey compiled by The Art Newspaper, published in April 2013, the Acropolis Museum is in number 59 spot worldwide.